What is Metatarsalgia – Ball of Foot Pain? Metatarsalgia is a general name given to pain in the front part of your foot under the heads of your metatarsal bones. This is the area on the sole of your foot, just before your toes. It is sometimes called the ball of your foot. Metatarsalgia can be caused by a number of different conditions affecting the foot. It is really a symptom of other problems rather than a specific disease itself. Overuse. For example, in runners and athletes, which can cause some mild inflammation in the metatarsal heads and nearby joints. Other sports such as tennis or sports that involve jumping may also put extra stress on the metatarsal heads and lead to inflammation and pain. Wearing high-heeled shoes. This can put extra stress on the metatarsal heads. Footwear that is poorly fitted or too tight may also be a cause. Being overweight. This can put extra stress on the feet in general. Having a stiff ankle or Achilles tendonitis (the tendon at the heel). This can affect the way that pressure is distributed across the foot and may lead to extra stress on the metatarsal heads. Morton’s neuroma. This is sometimes called Morton’s metatarsalgia. It is a condition that affects one of the nerves that run between the metatarsal bones in the foot (the plantar digital nerves). Symptoms include pain, burning, numbness and tingling between two of the toes of the foot. Claw foot (pes cavus). In pes cavus, your foot has a very high arch which does not flatten when you put weight on your foot. It happens because of an imbalance in the muscles of the foot. It can run in families. Sometimes pes cavus can happen out of the blue. However, most people with pes cavus also have a neurological problem such as cerebral palsy, spina bifida, muscular dystrophy or polio. Pes cavus can mean that extra stress is placed on the ball of the foot, which can lead to metatarsalgia. Hammertoes or claw toe deformity. With a claw toe you have an abnormal position of all three of the joints in the toe. 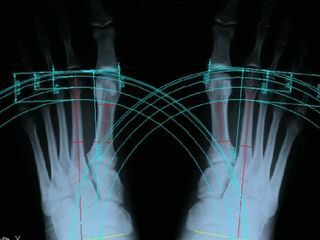 The joint with the metatarsal bone is bent upwards, the middle joint in the toe is bent downwards and the end joint in the toe may also be bent downwards. The toe resembles a claw. With hammertoes, your toe is permanently bent at its middle joint so that it looks like a hammer. There are a number of conditions that can cause these toe deformities. These can include poorly fitted shoes, injury to the toes, bunions and rheumatoid arthritis. Hammer and claw toe can also occur in someone with pes cavus. They can also run in families. These toe deformities can mean that extra stress is placed on the ball of the foot, which can lead to metatarsalgia. Bunions (hallux valgus). A bunion is a deformity of the base joint of the big toe, causing the big toe to be angled towards the second toe. This causes a bump on the side of the foot at the base of the big toe. There is often thickening of the skin and tissues next to the affected joint. The thickened skin and tissues may become inflamed, swollen and painful. Because of the bunion, extra stress is put on the ball of the foot and this can lead to metatarsalgia. See separate leaflet called Bunions for more detail. Previous surgery to the foot. For example, previous surgery for bunions. Stress crack (fracture) of a metatarsal. A stress fracture is a type of incomplete fracture in a bone. Stress fractures tend to occur as a result of overuse and are known as overuse injuries. A metatarsal stress fracture is a stress fracture in one of the metatarsal bones in the foot. See separate leaflet called Metatarsal Fractures for more detail, including metatarsal stress fractures. Freiberg‘s disease. This is a rare disease characterized by osteonecrosis of the second metatarsal, most commonly seen in teenage girls. Arthritis or gout. This can cause inflammation of the joints in the ball of the foot or of the big toe and can be a cause of metatarsalgia. See separate leaflet called Gout and those on arthritis for more detail. Diabetes. This can cause damage to the nerves in the feet and can be a cause of metatarsalgia. Please refer to the separate leaflets on diabetes for more details. Metatarsalgia causes pain in the ball of your foot that can be made worse by standing, walking or running. Some people describe the pain as feeling like they are walking on pebbles. Others describe more of a general aching pain. The pain can occur in one or both feet. In some people the pain is felt under one or two metatarsal heads; in others it is felt under all of them. Metatarsalgia usually comes on gradually over some weeks rather than suddenly. The affected area of your foot may also feel tender when you (or your doctor) press on it. Blood tests. These can check for diabetes, arthritis and gout. X-ray of your foot. This can show a problem with the bones or joints in your foot. Bone scan of your foot. Your doctor may suggest this if they suspect a stress fracture of one of your metatarsal bones. An ultrasound scan. Can be used to detect Morton’s neuroma. Other tests. Occasionally more detailed tests, such as a magnetic resonance imaging (MRI) scan of your foot, are needed. Resting with your feet elevated where possible. Wearing shoes that are well fitted, low-heeled and have a wide toe area. Metatarsal pads and orthotic inserts for your shoes may help to relieve pain in your foot by reducing the pressure placed on the heads of your metatarsal bones. Physiotherapy may also be helpful. This may include exercises to help a stiff ankle or exercises to help stretch your Achilles tendon if these are problems for you. Simple painkillers such as paracetamol and non-steroidal anti-inflammatory painkillers (NSAIDs) such as ibuprofen may help to relieve pain. Other treatment will depend on the underlying cause of your metatarsalgia. For example, if diabetes is the cause, you may need better control of your diabetes. If gout or arthritis is the cause, you may need treatment for these conditions. Surgery is sometimes needed to treat metatarsalgia if other treatments have failed. This will depend on the underlying cause – for example, straightening of hammer or claw toes or surgery for Morton’s neuroma. use of your metatarsalgia. For example, if diabetes is the cause, you may need better control of your diabetes. If gout or arthritis is the cause, you may need treatment for these conditions. Surgery is sometimes needed to treat metatarsalgia if other treatments have failed. This will depend on the underlying cause – for example, straightening of hammertoes or claw toes or surgery for Morton’s neuroma.